The release of Penfolds wines on 15 October will create a great wave of publicity, intense retail activity and widespread consumer interest, especially in the heady prices. Are the wines worth their asking prices? Can buyers resell the wines profitably? Or, as has happened so frequently in the past, will auction prices fall below retail levels? Many people hoard Penfolds wines, whether to drink, gift, resell or, unintentionally, bequeath (what a wake). However, speculation in wine remains as fraught and risky as any investment; perhaps even more so as wine generates no income – just the hope, often illusory, of a capital gain. Meanwhile the wine risks spoilage, breakage and dinner party raids. 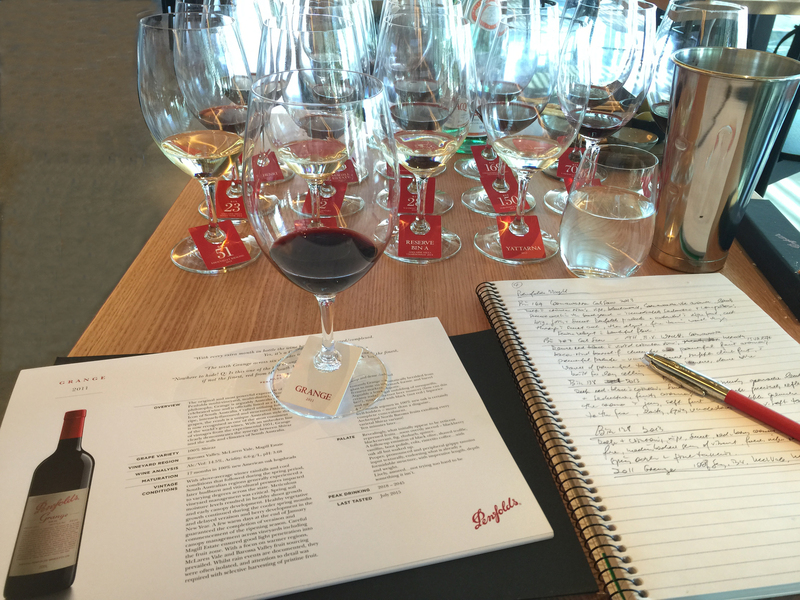 Best then to look at the one great certainty Penfolds provides: the distinctive style, exceptional quality and long-term cellaring potential of the top reds – an quality now shared by the whites, albeit with generally shorter cellaring windows. From a good Eden Valley vintage comes this floral and lemony riesling. A core of plump fruit gives it immediate appeal. But its intensity, delicacy and strong line of acid suggest long-term cellaring. Ultra-fresh Bin 311 2014 combines melon-rind and grapefruit-like varietal flavours with the texture and the slightly funky, biscuity influence of fermentation and maturation on yeast lees, without obvious oak flavours. Spontaneously fermented in mostly new (82 per cent) oak barrels, Reserve Bin A shows a powerful, if oaky, face of chardonnay. Despite the power, oak and yeast-lees character, the wine shows lemon-zest freshness in a bold style. Like Hardys with its Eileen Hardy flagship, Penfolds quest for the finest cool-climate chardonnay led it steadily south to Tasmania, which now contributes the majority of fruit. This is profoundly good, oh-so-fine chardonnay. Another bottle please. Winemaker Peter Gago takes Bin 23 pinot in a unique direction. It’s gutsy, firm and clearly Penfolds in one respect. But the inclusion of whole bunches, a wild ferment and no filtration gives the wine a deep, earthy, savoury, tannic character well removed from fragrant, pretty-fruit styles. People will either love or hate its idiosyncrasy. That Marananga, in the western Barossa, is home to some of Penfolds’ favourite shiraz, shows in Bin 150’s irresistible, ripe, juicy fruit flavours. And the fruit comes in layers with plump, ripe tannins, and the uplifting influence of first-class oak. From a diversity of regions, ranging from warm to cool, Bin 407 shows definitive, ripe varietal flavours of cassis and black olive, with an overlay of sweet oak and the variety’s authoritative, firm tannins. The ripe, alluring aroma that’s neither cabernet nor shiraz, leads to a tremendously vibrant, buoyant palate, seamlessly combining cabernet’s power with shiraz’s subtle, juicy, flesh. Oak lifts the whole wine and firm tannins wash through a great Bin 389, with long-term cellaring potential. An inviting, sweet, fruity-earthy shiraz aroma leads to a buoyant, lively palate with deep, sweet, red-berry shiraz flavours – caressed by the finest, softest tannins imaginable. This is one of the best ever – a truly great Australian shiraz, destined to evolve for decades. One of the best Magills yet, from a warm vintage, retains the distinctive, elegant and medium bodied style. Ripe, plummy, jube-like fruit aromas lead to a warm, lively, seductive palate, where the high-quality oak gives thrust and spice to the lovely fruit. RWT shows a fragrant, fruity, supple side of Barossa shiraz, supported by high-quality French oak; it contrasts strongly with the power, and American oak influence, of Grange. Luscious fruit flavours, reminiscent of ripe, black cherry, saturate the 2013’s palate, combining lusciously with ripe, soft tannins and an appealing cedar-like character, derived from maturation in French oak barrels. Bin 169 cabernet provides an elegant contrast to the great power of Bin 707. In the warm 2013 season, Bin 169 leads with ripe, blackcurrant-like varietal flavour, with a touch of leafiness. Sweet oak and tannins come in waves, washing through the ripe fruit flavours and giving a uniquely “Penfolds” experience. I would expect Coonawarra’s elegance to emerge as the wine matures over the next few decades. Bin 707 resembles Grange in its dense, crimson-rimmed colour, distinct barrel-ferment character and unique elements of its aroma. However, these are mere seasonings to a potent cabernet, built on amazingly concentrated fruit, in a matrix with powerful, ripe tannins, partly oak derived. Like Grange, Bin 707 becomes increasingly finer and elegant with very long term cellaring. It’ll be a wonder and a joy to experience the journey of this great vintage. From one of the coldest, wettest vintages on record, comes a successful Grange, whose sweet, ripe fruit belies the cold season. The fruit proved flavoursome enough to absorb 17 months’ maturation in new American oak hogsheads. The palate combines fruit, oak and winemaking inputs in typical Grange style. But the vintage character shows in the way the supple, ripe fruit bubbles up through the tannins on a softer, more approachable palate than usual. However, even soft, easy-drinking Grange (1982, for example) ages well, and I’d be surprised if the 2011 isn’t drinking well 30 years from now. Penfolds supplied these recommended prices ahead of the 15 October release. Expect retailer discounts.